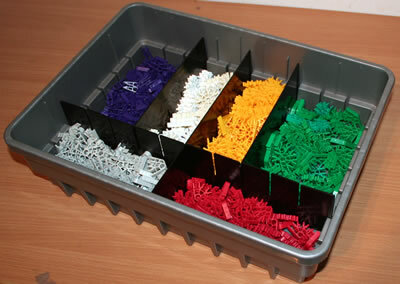 Some K'NEX sets come with K'NEX gears. 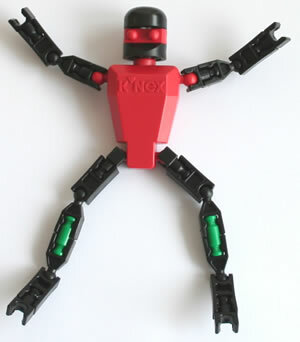 They can also be bought separately as parts in our K'NEX shop. 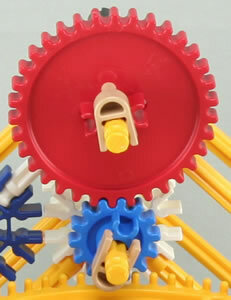 The gears enable a turning motion in one K'NEX rod to be transferred so as to become a turning motion in a second, parallel K'NEX rod. In the photo, the medium red gear has 34 teeth, and the small grey gear has 14 teeth, so the rod on the right will turn 34 divided by 14 = 2.43 times faster than the rod on the left. 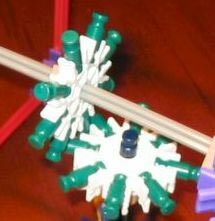 Some K'NEX gear wheels have teeth that extend beyond the surface of the wheel. These are known as "crown gears". This allows the gear wheel to also transfer a turning motion from one K'NEX rod to another K'NEX rod at right angles to it. The red and yellow gears in the photos above are the same width, 55mm. 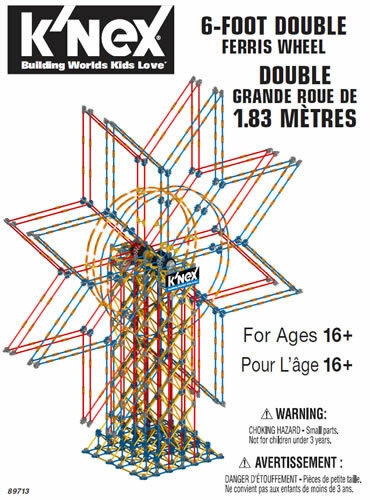 A much larger crown gear is also available, 130mm in diameter, as shown in the photo opposite. 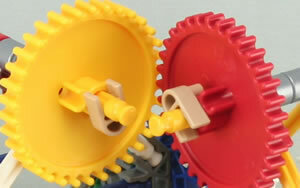 In the photo, the large yellow gear has 82 teeth, and the small grey gear has 14 teeth, so the rod at the bottom will turn 82 divided by 14 = 5.86 times faster than the rod at the top. 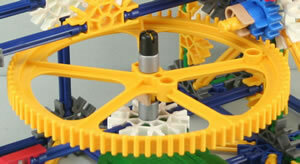 If you do not have any K'NEX gear wheels, a gear wheel may be made by putting 8 green rods into the 8 slots on a white connector. Two such wheels may then be used in combination, either to transfer motion between two parallel rods, or between two rods at right angles to each other.